City of the Dead are a doom rock power trio based in Cleveland, Ohio. 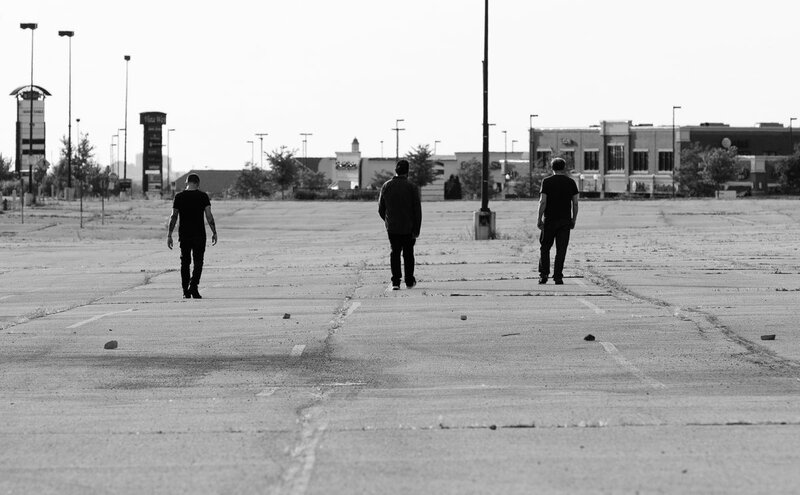 After forming in 2017 over a love of classic post-punk and noise rock groups, they hit the ground running by writing a large amount of original material and playing a series of shows across Ohio. In November 2017, they decided to take the plunge and enter the studio to record a series of live tracks that would eventually be released in the form of their debut EP. The resulting product, ‘Bloodlines’, serves as an effective showcase of an ambitious and talented band who live and breathe live performance. The EP confidently opens with the instrumental track ‘…’, which kicks off with an electronica synth line cascading over a stoner-like clean guitar riff. As the rest of the band enter with pounding toms and rumbling bass, the tempo gradually speeds up before launching into a ear-splitting doom rock-influenced chord progression. This instantly displays one of the band’s biggest selling points; their effectiveness and talent as a live act. The arrangement fluctuates in tempo throughout and drifts in and out of time, which works fantastically well with their genre and adds a real human element to their sound. The fact the band chose to record the EP live without the aid of a click track also stands as a testament to their fantastic attention to detail and full awareness of their abilities in a live setting. Warping feedback closes out the track, gradually morphing into the opening riff of ‘Reboot’. Particular praise on this track goes to drummer Dan Garrity for an excellently-written and thoroughly-effective drum part. He alternates between thundering tom beats and pummeling crash cymbal sections, propelling the momentum forward as if it’s his for the taking. Whilst his part is certainly technical and a good display of his abilities, it’s very suited to the needs of the track. This displays a fantastic sense musicianship and great attention to detail. Vocalist/guitarist Elliot Barry also showcases a brilliant vocal delivery; the verses are snarled and carry just the right amount of sarcasm to adequately reflect the lyrical content, whilst the chorus features a set emotionally charged screams. His delivery is confident and genuine throughout, whilst also being very fitting of the genre. ‘S.O.S’ showcases the band’s psychedelic influences, making use of synth tracks, guitar harmonics and complex rhythms. My attention turns to the band’s adherence to the power trio format, which is overall very good. Garrity does an excellent job of filling out the midrange by making use of his toms at every opportunity, which adds a larger-than-life sound to many of the arrangements. Bassist Chad Martin makes use of a slightly distorted and treble-heavy bass tone, which also contributes to filling out the midrange and effectively makes up for the lack of a second guitarist. Barry makes use of a wide range of guitar tones and techniques, which keep each arrangement interesting and varied. Whilst the EP was primarily recorded live, the tracks do feature a selection of overdubbed samples. It may be worth the band giving some consideration to how they’d like to incorporate this element of their sound into a live setting. The band also make use of the classic ‘loud-then-quiet’ style of arranging, which was popularised by many grunge bands of the late 20th century. The dynamic contrast effectively maximises the impact of the louder sections, which works fantastically well with the power trio lineup. ‘Into the Unknown’ opens with an ambigous clean guitar riff before easing into a more laid-back slacker groove. The vocal production on this track is interesting, being somewhat electronic sounding and distant. I found this made the lyrics somewhat hard to decipher, although I believe this may have been intentional. At this point, my attention turns to the band’s sonic identity, which is very well-focused and effectively-channeled. The band certainly know their signature traits and take full advantage of them; these include a great live feel, ambiguous clean riffs, thundering tom beats and dynamic contrast between sections. The music is consistently set in the slacker and grunge genres, showing the band are very aware of their genre and have effectively focused their sound. They dabble in psychedelic influences on several tracks, which I thought was very effective. I’d like to see them incorporate more of this on future releases as I’m confident it would help them craft a sound that’s unmistakably ‘City of the Dead’. ‘Mindfuct’ opens in a jovial and lighthearted manner, featuring influences of first-wave pop punk and nu metal. Barry’s vocal performance on this track is particularly strong, with the screamed sections featuring a good amount of sustain and a real sense of emotion. The track features a great dropout section around halfway through; the arrangement is reduced to hi-hat, synth and vocals, before easing into a half-time representation of the material used in the first half of the track. I thought this was a fantastic bit of songwriting and a technique I’d very much encourage the band to continue to employ in future. This also gave the overlapping vocal coda of ‘Let it go/Nothing has changed’ a real sense of impact. ‘Algorithm’ opens with a delayed clean guitar line and a set of drum stabs, before being contrasted with a guitar-laden grunge section with distorted, screamed vocals sitting atop the mix. At this point my attention turns to the EP’s production, which is overall good and very suited to their genre. The absence of a click track showcases the band’s fantastic live feel and was certainly the right choice to make. The mixing and mastering has a great raw and live feel to it, almost drawing the listener into the room with the band. Whilst this is very suited to the band and their genre, the lyrical content did become hard to decipher at various points. Whilst this is a common feature of the grunge/doom genres, it may be worth considering a slightly louder vocal mix on their next release in order to make the lyrics as effective as possible. The EP closes out with a real bust of ambition on ‘Path of Tonality’. This track has a great metal feel to it and is driven forward by arpeggiated guitar lines and a fantastic rumbling bass part. Interestingly, I thought this hinted at a slightly new direction for the band and could effectively serve as a bridge between the band’s debut and sophomore releases. I’m certainly excited to see if the band choose to pick up and run with this style and am overall left wanting to hear more from the group. ‘Bloodlines’ effectively showcases a band who are overtly aware of their sonic identity and clearly confident in their abilities as a live band. Highly recommended for any fans of grunge, doom or metal. ‘Bloodlines’ was recorded in November 2017, but wasn’t released until the following August. How come you decided to hold back on the release? We just wanted to make sure everything was good and nothing sucked. Lol. The mindset when writing is to try and keep it interesting, quality over quantity. I know people have way shorter attention spans then ever before so It’s harder to get anyone to listen to your music. If you can actually get people to listen, you gotta keep em interested. Sometimes what you come up with just isn’t good enough and you gotta push your self until you get it right. The music was tracked live all in one weekend but the vocals had a ways to go, so we took our time with that. Well, we have a long history together. The 3 of us started off in a grunge/garage/punk band called Lovespank in the early 2000’s. (2000-2006) After Lovespank disbanded Garrity joined indie rock band Kid tested, Chad and Elliot formed the stonerpunk band Space goblin with Chad on drums and Elliot singing and playing guitar. After that, Elliot and Chad played in a number of cleveland bands: The missing(punk), The X Members(metal-Billy), Snotrockets(punk), and The Bullet Party(progressivestonerpunk). When we started this project, we had a hard time finding our sound. We kind of wanted to do like a sonic youth meets Mastodon type thing lol. After Chad bought the moog, we started experimenting with more ambient stuff and it started to come together. We booked our first show under the name Space Goblin just so we could get on a show. Our first show as City of the dead was in Dec of 2017. What inspired you to go with a three-piece lineup and what do you think the advantages of being a power trio are? We couldn’t find anyone else. Lol No we knew right away we wanted to be a 3 piece. Two of my favorite bands currently our whores. and Elder( I think elder added a 2nd guitarist recently) but they are both killer 3 piece bands. All of us grew up huge fans of Nirvana, the Melvins, Rush, Hendrix, and ZZ Top. It’s a lot easier when its only 3 people. Less is more, you just need to get the most out of each part. I noticed this EP features a couple of guitar overdubs and synth tracks. How are you aiming to incorporate these aspects of the EP into your live performances? This record was recorded live(besides the vocals), so everything can be done live(including the vocals)lol. There’s a cpl sound fx at the end of tracks that we would just use a loop pedal for. We are actually doing the record live at our next run of Shows. Ive always wanted to do that but all my other bandmates thought it was lame. Another benefit of being in a 3 piece. What’s next for City of the Dead in terms of new material? We are already working on new material. The goal for us right now is to get as much content out there as possible. A couple music videos and then we’ll probably do a 3 song ep followed by a full length.